First Choice has extensive experience in specifying, installing and commissioning septic tanks. Our experience really does make a difference, giving you a fit-and-forget solution that will provide years of dependable service. Stringent regulations govern the installation of septic tanks, and there are several reasons why a septic tank may not be appropriate for your property. You can count on us for the best possible guidance. Still Don’t Understand? Then Get In Touch With One Of Our Professionals Today And We Will Answer All Enquiries! 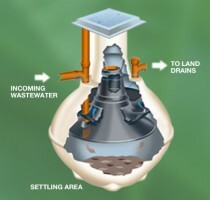 A – Waste water and sewage from the property is fed through to the septic tank. B – The septic tank allows the solids to settle out at the bottom. The tank must be emptied out periodically, typically once a year. C – The absorption field (or ‘soakaway’) is a critical component, as it allows the untreated liquid element of the sewage to soak away underground where it is dispersed naturally. A septic tank is a watertight enclosure designed to allow solids in the sewage to settle and decompose via bacterial action over a period of time. Simultaneously, it allows the liquid effluent to separate out and disperse into the soil via a land drain system. 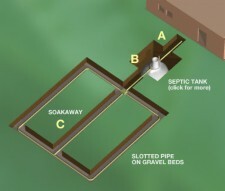 A septic tank collects and stores sewage solids. As the tank fills up, it will need emptying. This is typically done once a year by a local contractor. Tanks come in different shapes and sizes, and are chosen to match the demands placed by the users of the property. Septic tanks are typically of GRP (glass-reinforced plastic) construction. We use fully certified tanks from Titan and Klargester.